Imagine you’re building an off grid tiny house and you’re trying to figure out your solar setup. You’re going to need panels, batteries, and a charge controller at a minimum. But how big should your system be? You might be inclined to head online to find a solar energy calculator to size your system. 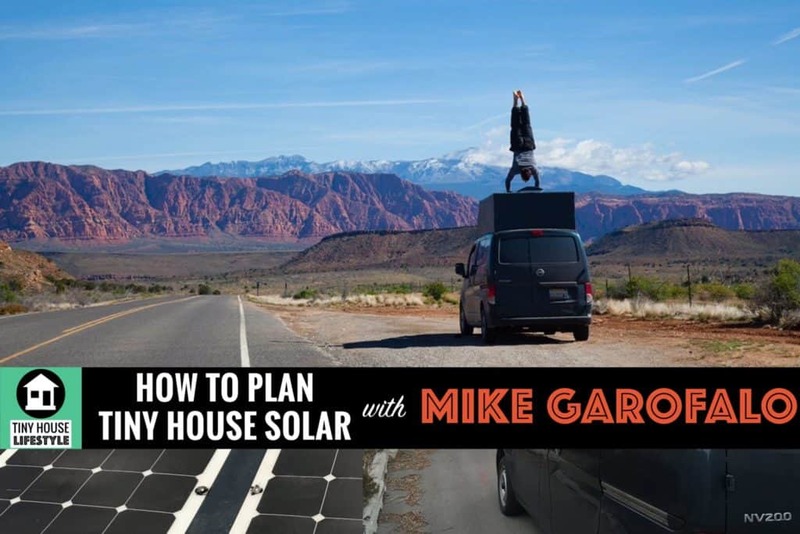 But after you listen to this interview with Former Tesla Lead Solar Installer Michael Garofalo, you might think twice about just jumping to an online calculator. Mike will show us how to do these calculations ourselves to make sure we wind up with the correct results. Plus, learn about the rest of the parts and pieces you’ll need in your tiny house solar array. With some basic math, you can calculate everything you need to know about your solar needs. Solar isn’t rocket science, but it is complicated. The most important thing to do is to plan. The more you know about your energy needs and where you will live, the more accurately you can size and design your solar setup. What’s the difference between deep cycle and regular batteries? How to approach wiring a tiny house with a mix of DC and AC appliances?